I read this article and found it very interesting, thought it might be something for you. The article is called Army Chief Complains, Navy Gets To Spend It and is located at https://archive.indiaspend.com/sectors/army-chief-complains-navy-gets-to-spend-it-25229. India’s Chief of Army Staff (COAS) General V K Singh kicked up a holy row last week by revealing that he had been offered a Rs 14 crore bribe by an equipment lobbyist to favour the purchase of 600 sub-standard vehicles. On the heels of the revelation that rocked the country followed the leak of a letter written by General Singh to the Prime Minister bemoaning the state of affairs in the army. “The country’s security might be at risk owing to the fact that tanks are running out of ammunition, air defence is going obsolete and the infantry is operating without critical weapons,” he reportedly said, appealing for suitable directions to enhance the preparedness of the army. How bad is the condition of India’s army indeed? We are not equipped to answer that question at this juncture but IndiaSpend’s Sourjya Bhowmick looked at the composition of defence expenditure in Union Budget 2012 closely. The key findings: The Navy has got the lion’s share of modernisation expenditure at least in this round. Not all the capital expenditure seems to be going into acquisition of fresh assets. And finally, the lion’s share of defence spend is consumed by pay, allowances and pensions. While this may be the general norm, the proportion seems unusually high. Equally worth examining is the break-up of the defence spend itself. The Union Budget 2012-2013 allocated Rs 1,93,407 crore to the Defence Ministry, which is a hike of 17.63% over last year. This is the highest increase over all the years, for the exception of the outlay during 2009-10 which had a hike of 34% only to implement recommendations of the 6th Pay Commission. The current debates are raging around the Capital Expenditure being what could arguably drive the modernisation of the armed forces. This is also the issue that General Singh raised in his missive. Let’s look at the big picture first. As is evident, the Defence forces will spend around Rs 80,000 crore in equipment and physical assets. Now, let’s see how this figure gets further split up. From the table below, it’s clear that ‘construction’ itself forms is a large part of expenditure, at least for the Army. But Pay & Allowances and Pensions are clearly very substantial heads. The other heads as listed in the Budget documents do not reveal that much though IndiaSpend will seek more details shortly. * Pays, Allowances and Pensions are Revenue Expenditure. Now, let’s look at the total Capital Expenditure of the Army, Navy and Air Force of last year and this year – being an aggregate of the above. The Navy has seen a major increase in allocations compared to the previous year and to others. Now, there are other claimants to the Ministry of Defence’s budget though the Army, Navy and Air Force represent 91% of it. The other entities include National Cadet Corps and the Ex Servicemen’s Health Scheme. However, we can see that the increase is mostly in the Navy when it comes to modernisation. 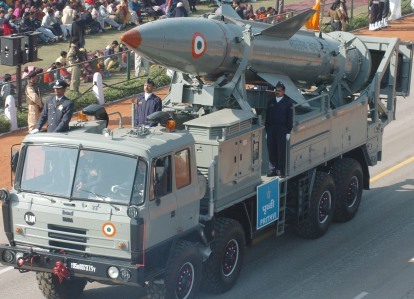 According to statistics published in the Stockholm International Peace Research Institute (SIPRI), which was recently reported in the Guardian, India is right now biggest importer of the weapons. Incidentally, China’s overall defence budget is $100 billion, where India’s is less than $40 billion. Returning to the General Singh’s bribe charge, numerous procurement scandals have plagued the Indian Defence Services in the past. Many are still under investigation. They include the Bofors Gun Deal, Barak Missile Scandal, Scorpene Submarine scam among many others. An important, less discussed aspect of the Defence Budget is the civil estimates and the pensions. The amount budgeted for ‘pensions and other retirement benefits’ and ‘rewards’ is Rs 39,000 crore. Apart from pensions and awards there is another domain which gets Rs 5,798 crore. Here are some figures. Public Works (Maintenance, Construction, Repair of Defence Services buildings) – Rs 66 crore. On adding of Rs 39,000 crore (pensions, benefits) and Rs 5,798 crore, the total Defence Budget stands at Rs 2,38,205 crore. The Revised Estimates for last year was Rs 2,09,210 crore. The Budget for 2011-2012 was Rs 2,02,572 crore. The Revised Estimates for 2011-12 show that the amount increased by Rs 6,638 crore. Now, if we look at the Defence Budget 2012 as a whole. The hike in allocation is 18% but in reality its actually 13% over the revised estimates of last year. The revised estimates last year was Rs 1,70,937 crore, which was a hike of Rs 6,521 crore over the budgeted amount. The defence budget this year has increased as a share of the Gross Domestic Product (GDP). In 2011-2012 it was 1.83%; in 2012-2013 it was 1.9% of the total GDP. Incidentally, defence expenditure as a share of the total Central Government Expenditure has decreased from 13.07% to 12.97%. Another important point in the budget pertains to the Capital Expenditure and Revenue Expenditure. The estimates for Revenue Expenditure is Rs 1,13, 829 crore which is an increase of Rs 18, 612 crore from that of the previous year, when it was Rs 95,217 crore. It is a growth of 19.55%. The share of revenue expenditure in the defence budget this year is 59%. While IndiaSpend is only highlighting the figures and their breakup now, in subsequent months, we will look more closely at the defence numbers and also give you how the figures stack up when compared to other large countries.